Equal access. That’s all French disabled voters want. But, what exactly does equal access mean? 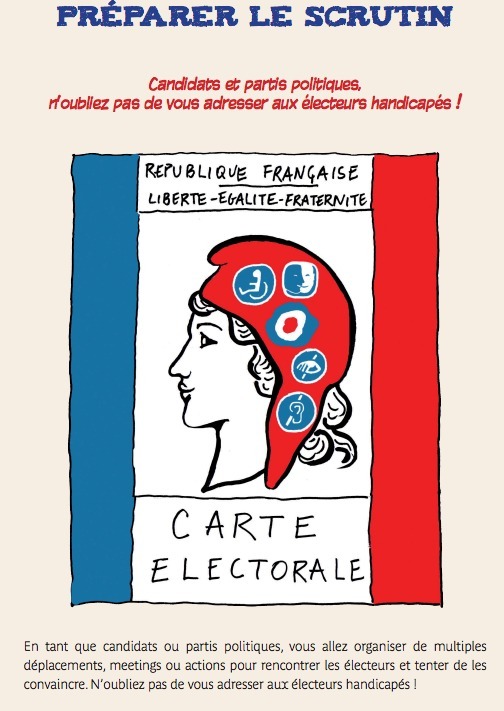 It means to be able to exercise their right to vote as any other French citizen would, without any constraints, by having all the tools and modifications available for them to do so. To make all polling sites accessible to people with disabilities. ( It’s a promise that initially had 2015 as a deadline but that will unlikely be met). Political conferences must also be held in buildings that are accessible to disabled people, no matter what their handicap is. For people in wheelchairs, make sure that circulation isn’t blocked so that they may be able to come in without any danger (no furniture, TV cameras, electrical cables) and allow them large entryways so they may come through. Access to restrooms and elevators for people with disabilities. They also ask political figures to produce a version of their discourses better adapted for people with an intellectual handicap. Nice post. I used to be checking constantly this weblog and I am inspired! Very helpful information specially the last phase 🙂 I deal with such information a lot. I was seeking this certain information for a very lengthy time. Thanks and good luck.